posted August 01, 2009 09:34 AM bonus applied by angelito on 12 Jun 2010. Edited by Warmonger at 21:04, 22 Jan 2017. 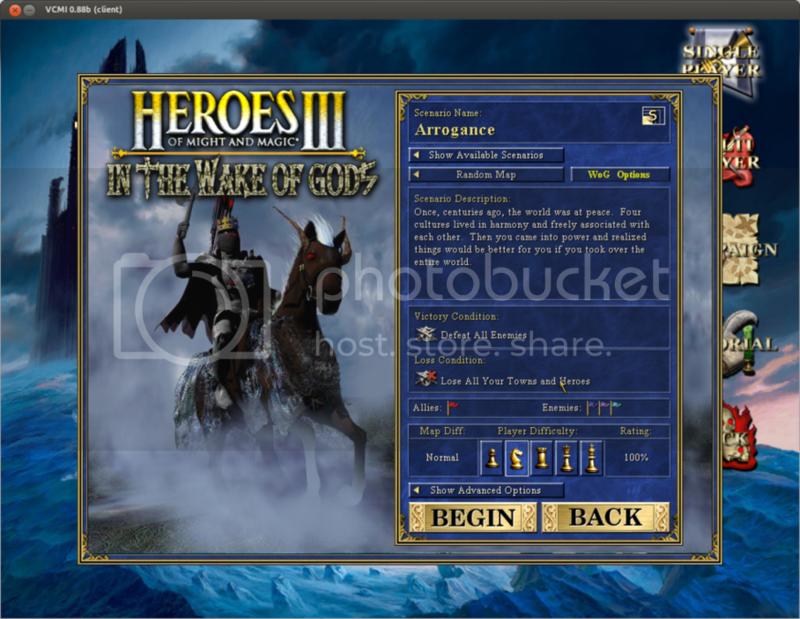 The purpose of VCMI project is to rewrite entire HOMM 3: WoG engine from scratch, giving it new and extended possibilities. We are hoping to support mods and new towns already made by fans, but abandoned because of game code limitations. VCMI is fan-made open-source project in progress. It already allows support for new mods, higher resolutions and extended engine limits. VCMI is not standalone product, it requires original game. VCMI can be installed either clean Complete / Shadow of Death version. The community working on project is open and seeks for your help or advice. If you are interested in game modding, know C++ or just have a good idea - don't hesitate. Every contribution is welcome. See here how you can help VCMI grow! - Please DO NOT report bugs in this thread. - Download and build VCMI sources, as described here. - Best mods will be hosted on our server and available instantly via Mod Manager! Thanks for everyone who helped us with testing and improving VCMI. Now here's a project that actually has a huge potential. Edited by Wight at 16:50, 01 Aug 2009. Have you read the description?!? Or you mean what it stands for?!? Great news to see this project living. Will you change the way some hero specializations work ? I mean, to link them to the hero level (resource spawners equally useful at lvl 1 or lvl 50). Do you plan to give each hero an unique specialization ? currently, quite a lot have the same as another. You talk about changing existing images to 32bit ones. Does it need some graphic skills or only photoshop installed ? I don't really know how to do it, but if the only thing to do is : load the image, save it in another format, I can surely do this for you. Anyway, if you really manage to release this mod with evey planned feature I can see in the first post. This could be the best thing Heroes 3 fans could dream about. This would mean for instance the end of "want-to-be-modding-fans-but-can't-cause-can't-learn-erm" and this kind of stuff. I will follow this with inerest though. Keep us aware ! Edited by Warmonger at 19:31, 01 Aug 2009. If you load the image and save it in another format, it will simply use four times more memory than now. We need to increase quality of images - but there are hardly any graphicans in the team and we have other priorities. An interesting option is to add alpha channel (transparency) for some objects and effects, for example ghost units and spell effects. It's up to you, just make it look better. Will you change the way some hero specializations work ? First of all we want to recreate original H3 gameplay, but once it's done we will support any mod. If ur aim to recreate original gameplay, why do u need to use WoG then? Recreate SoD with AB and add a support for Heroes Chronicles as campaign modules there. Looks really nice. Just one minor thing, though - the font kind of bothers me. Edited by Warmonger at 08:36, 02 Aug 2009. It we could do everything on our own, we wouldn't need any help. You know what you can (or can't) do better than any of us. If you have a good idea, just present it on the board. It shows that you have a talented and motivated team. Can't wait for the stand-alone release to test all of this. I'll try with my weird WoG version though. 1. In some fights in a certain terrain, when player A attacks [player B || neutrals] there�s some X possibility that some "third party neutrals" (naturals from the terrain) might also appear, attacking both partys. 2. Food or some kind of supply for creatures, i saw some script with similar ideas but dont know what happened to it. 3. when a heroe of a certain class adquires certain group of abilities, then he�s given a title & a bonus. 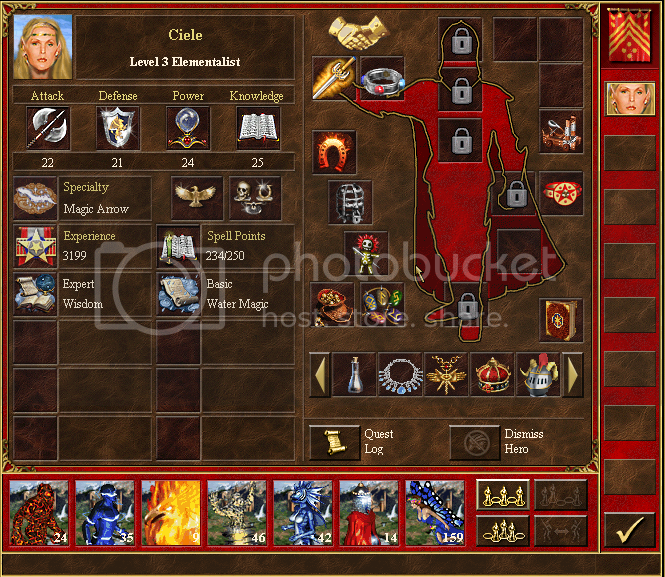 Similar to HOMM4. 3)Easy to do with basic scripts, already done in my 300 map. 1)I think Karmic battles suppose 2 enemies...i mean that the creatures are added to one or other faction in a battle and what i said is different. 2)Ive seen that map ERM but i think it does not integrate very well with the mithril concept. Two things could have happened: the food/starve ERM didnt function properly as i had mithril concept in the map or i just couldnt adapt the script to my map. 3)I will check that one...thanks! Edited by Salamandre at 04:04, 03 Aug 2009. Not wrong, but nuanced. The Karmic battles add neutrals on the defender party. Slight modifications would add neutrals to both parties, but again, the game balance would be disturbed. The human is supposed to have a hard time to beat the AI, and you want to give randoms creatures to the human against AI? The food script is "Lose Troops and Stats from Toxic Lake". It is not about food but about visiting a toxic structure, which affects the health of your party. You have one week to heal, or die. The "toxic" concept can be modified to "food" concept with same consequences (lose HP each day). Nothing to do with the mithril script. To be realist, I would predict a few years for a really revolutionary project, unless those gifted guys accept to work together for a better Heroes. We have 3.59 team, WoG core team, HoTA team and VCMI team, everyone holding brilliant programmers. But split among hundred of projects. Edited by Warmonger at 07:15, 03 Aug 2009. I don't understand how to start game with these mod?? I was copy all files in C:\program files\3DO\Heroes and what now?? Type 'resolution' in console or edit settings.txt in config folder. We need new graphics to create more convenient menu. But you can download and run VCMI already to see it's not a fake And no, it's not starting - we actually speed up as two new members joined the team. But yes, it will take another year at least. Warmonger, ive coded very little Turbo C applications but have two years experience with C# as a high-level application developer at work. There are many open features to be implemented, so just choose one and check repository to learn what and how. Contact Tow or Tow Dragon via our board for more details.